Next month's release of the Wii U marks the end of the GameCube's distinctive controller as a method for manipulating Nintendo games, but the color-coded buttons and sticks will always remain a method for making well-dressed attractive people look as if they are playing video games and not just smiling vacantly into a camera. It's been a while since we've visited the world of Fake Gamers, those pretty people playing at playing games in the pristine world of stock photography. Fake Gamer of the Week is no more, but that doesn't mean we can't visit our pretty friends now and again, marveling at their sublime disconnection from everything we hold dear. We once held the GameCube controller dear. That yellow C-stick, the red and green A and B buttons—it's an incredibly distinctive piece of gaming equipment. Those striking colors are likely why photographers love putting it in the hands of people that probably have no idea what it is. ...or a group of young men eating popcorn and jostling playfully while staring at someone taking a photo, it's impossible to be unhappy while not playing a game with a GameCube controller. See? Here comes the smile. Thanks, GameCube controller. 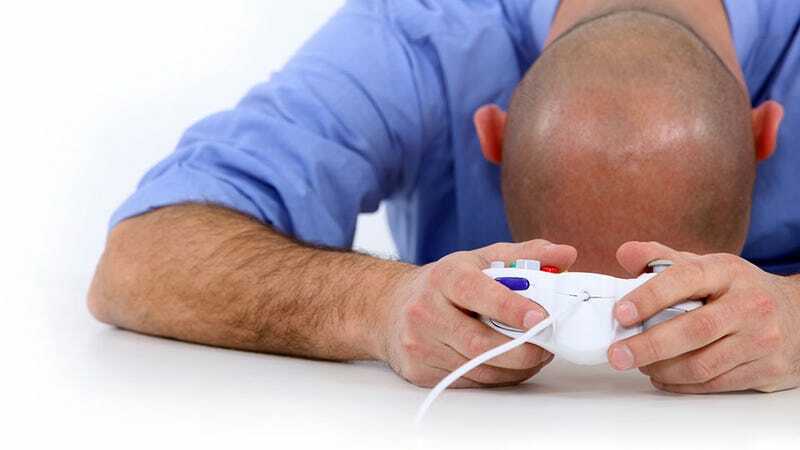 Fake Gamers is Kotaku's tribute to the strange and wonderful stock photo models of the world. Male, female, young, old; the beautiful, the ugly, the strange, and the disconcerting. We've got 'em all, with a new entry every Monday. Past Fake Gamers can be found at the Fake Gamers archive.